To get the numbers you want, it’s important that you start with numbers. Basing your efforts on concrete numbers will set you on a path to solid success. Use market research paired with your own research to establish your goals and define the target persona you are targeting. This will ensure your efforts and budget aren’t wasted on something non-beneficial to your target audience. With your research, build a target persona. A target persona is your target audience, personified as an actual person that you can speak to, create content for and think about when planning your efforts. Without defining your target persona, your content isn’t geared toward anyone specific, and your overall plan is without strategy. More importantly, you’re missing quality leads that you could nurture and convert into customers. Specific, Measurable, Achievable, Relevant, and Time-sensitive. We want our campaigns to be successful, and it’s important that the goals we set for ourselves and our teams are SMART. Every great B2B marketing campaign starts with strategic planning and embracing these SMART principles when setting goals is how you can prove the value of the campaign and your team’s efforts. Goals might include things like the number of leads, MQLs and SQLs generated, the number of new customers generated, and the amount of new revenue generated. Just because you’re working on a B2B marketing campaign, it doesn’t have to be boring! Spice up your life and be creative with it! Design an innovative concept and mission that stand out, speak to your audience, and explain the overall concept. This can include who you’re selling to, what you’re selling, you’re unique selling proposition, and the overall view of the creative concept behind this. Setting a budget can help you identify the channels you can use to reach your audience outside of your unpaid efforts and where you can allocate money. Having a budget can help to clearly define the methods you are able to take within the means your company is willing to commit to. 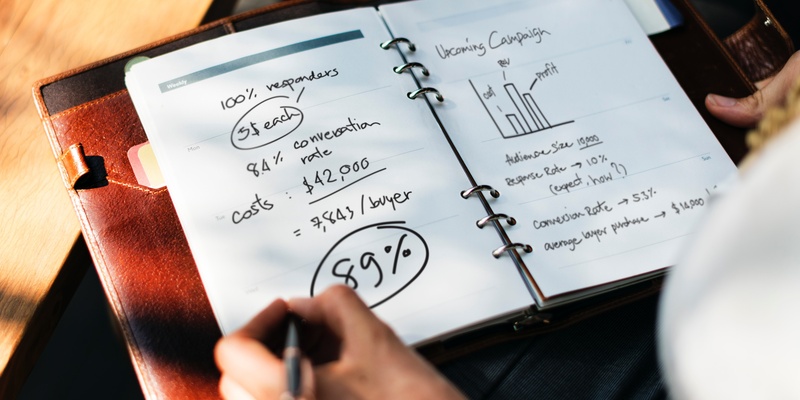 Use your research to help you establish which channels and efforts are best for your campaign and reaching your target audience, and present a budget that speaks from the research, detailing why this budgeted amount is necessary for your B2B marketing campaign’s success. Showing the ‘why’ behind the ‘what’ (your proposed budget) will help you explain to your company’s decision makers the reasoning you are asking for the said amount. It will also help you determine what you can afford, what you need to keep in-house and what should be outsourced. If you have multiple people working on various elements of a campaign, it's important to clearly outline everyone's roles and responsibilities. Communicate what is expected from everyone if the program is to be successful. This includes specific deadlines for each person's contribution. The strategy around the delivery of your content is critical to success, but the heart of your content must clearly deliver your message, speaking to the target persona. Content should be a focal point to reach and educate your audience. Content includes, but isn’t limited to, blog posts, premium content, CTAs, images and graphic assets, infographics, and more. Briefly touched on above in content, visuals are critical to catching the eye of your target persona. Studies show that humans are incredible at remembering visual content. Hear a piece of information, and you’ll remember 10% after three days. Add a picture to that information, and you’ll remember 65% after three days. Consider your target persona and what stands out to them when creating visuals and choosing images that pair with your B2B marketing campaigns. Creating great content is one part of the puzzle, but you want it to be found! It’s vital that companies make sure they are visible on search engines, and marketers must be creative with their SEO strategy to keep appearing in results. A strategic inbound marketing and content strategy based on research and keywords, and focused on the target persona will help boost the success of an SEO strategy. There are a plethora of paid media available to B2B marketers today. From social media advertising, Google Adwords, and other digital initiatives, to radio, billboard, and other traditional initiatives, the world of advertising could seem overwhelming to some. BUT, if you’ve done your research, know your target persona and understand where they spend their time and how they want to be spoken to, this will narrow down your options. Design your strategy for paid efforts around your target persona and the budget that comfortable for your company. Ensure the media you choose aligns with your overall goals and campaign plan, and it helps get you closer to reaching and converting your target persona! I’ve spoken to content and paid efforts, but one significant item that many B2B businesses overlook is the content they already have! When planning a B2B marketing campaign plan, don’t forget to comb through your blogs, ebooks, whitepapers, webinars, or other content you’ve created for this target persona in the past, and re-purpose it for your campaign! Blogs can be republished, ebooks can be used in lead nurturing workflows, infographics can be shared on social media, and there are many other ways to repurpose your content that you already have within the strategy of your marketing plan! Let no content go wasted! Just be sure it’s updated when re-purposing it for your new campaign efforts. What’s the point of putting in all of this effort for your B2B marketing campaign plan if you don’t have a way to convert eyes into leads!? Strategically consider how your target persona can be converted through CTA buttons on content you create, questions on forms, landing pages, and more. Once you’ve converted leads, you’ll want to continue to nurture those leads and determine what type of lead they are. Through lead nurturing workflows aligned with your sales team and sales process, leads can be qualified as MQL’s and SQL’s to continue moving them through the sales funnel. Having a plan in place for this before your campaign will help to align the sales and marketing efforts and ensure no lead is left behind! One element that's often ignored is the lead hand-off from Marketing to Sales. Remember, the goal of any marketing campaign it to generate revenue - not just leads. Clearly outline for the sales team what to expect. What kind of leads will they be getting? What should their next step with the lead be? How should they provide feedback? Well… you’ve done all the research, set your goals, brainstormed about your content and creative concept, aligned your efforts with your sales team’s efforts, and you’re ready to kick off your campaign. But don’t start until you determine what you will be measuring. Consistent measuring and analytics during your campaign can help you direct your efforts throughout the campaign, determining what is successful or not, and potentially helping you save money by stopping any efforts that are not showing any success. Some efforts will take time to show the success, but by having your KPI’s and analytics determined in advance, you can precisely track them over time and help to steer your B2B marketing campaign down the road to success. There are obviously many moving parts to a successful B2B marketing campaign. By strategically planning your campaign in advance based on these 13 key components, you will be able to deliver campaign results based on numbers, facts, and hard data that will drive your solid and structured B2B marketing campaign to see great success, delivering qualified leads that your sales team can use to deliver your company’s desired business results.